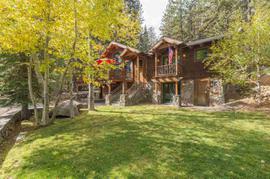 Currently there are 62 properties for sale in North Lake Tahoe. Properties range in asking price from $57000.00 - $2999990.00 with an average asking price of $842951 and a median asking price of $600000.00. Price per square foot ranges from $37.11/Sq Ft - 1072.93/Sq Ft. On average these 62 properties have been on the market for 172.84 days. 240 of these properties have reduced their asking price with the average reduction being $98387. 0 of the properties are distressed sales (either REO bank owned or Short Sale). 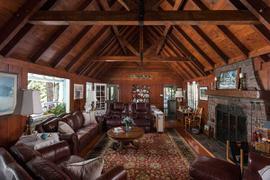 In the past 180 days, 90 properties have sold in North Lake Tahoe. Sales prices during this time period ranged from $125000.00 - $4950000.00. On average these properties were on the market for 132.06 days and final sales prices were on average 97.06% of the original listing price. 35.56% of the sales were reported as cash sales. As a broker and an agent with Coldwell Banker, I've been helping homeowners with North Lake Tahoe real estate since 1999. From the purchase of your Tahoe home to the ongoing maintenance of the house to getting the property marketed and ready for sale, I take pride in doing right by my clients regardless of the purchase price. 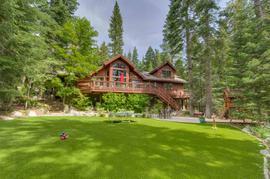 From quaint cabins to historic lakefronts, owning a home in Tahoe is unique for most families. 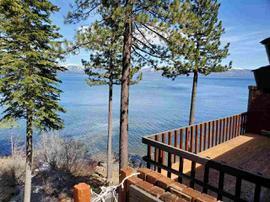 For the vast majority of homeowners, owning a slice of North Lake Tahoe real estate will be a second / vacation home. I'm extremely well respected in our community. 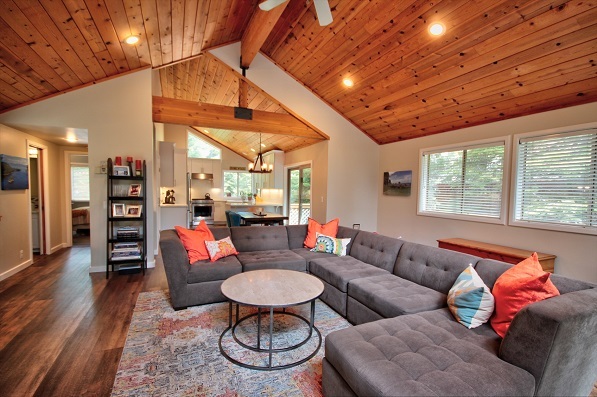 I know the real estate markets well and I'm connected with quality local Tahoe businesses that will support you through every step from purchase to maintenance to the sale of your home. Call or text me on my mobile at 1-530-448-1734 if you'd like to talk. Or email me at [email protected]. 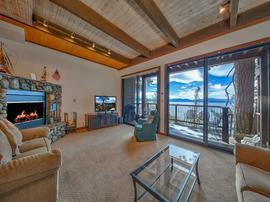 I've been a broker here in Lake Tahoe since 1999 and I know the real estate market well. I'm honest and frank with my opinions and I'm well respected with the consultants and businesses that service these special properties. I've helped a lot of homeowners over the years. I've heard their complaints about sites like Zillow and the "pick a color" inexpensive IDX websites. 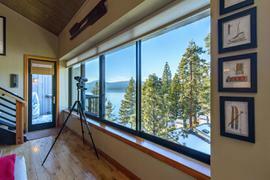 Both buyers and potential sellers wanted more information on the North Lake Tahoe housing market. I decided to make the extra effort to custom build a website that would fill the gaps in the real estate information offered online. CBLaketahoe.com uses the entire database from the North Tahoe MLS. We combine it with a database from the county. We have complete control of the data and it enables us to create statistics for even the smallest of subdivisions. You can find Tahoe home sales going back more than 10 years. We also have the ability to add our comments to the properties giving you as Paul Harvey said, "the rest of the story". Email me and say hello and let me know how I can be of help. When we talk about North Tahoe the region can be defined in many ways. Our real estate site and the homes listed within this section define the region as properties east of Dollar Point to Kings Beach and the Nevada state line. 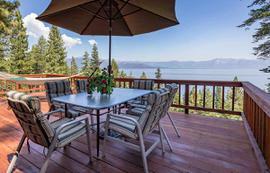 Many of us consider homes in the Tahoe city region as part of North Tahoe. 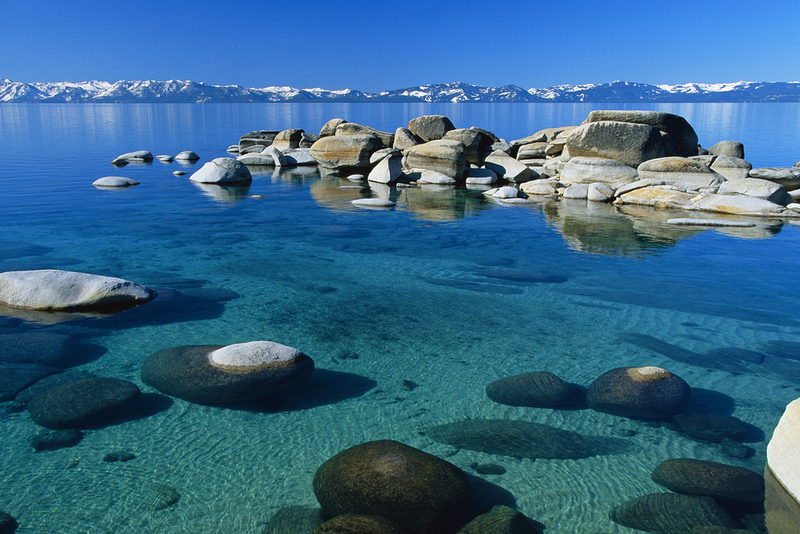 With our website Tahoe City is it's own region. 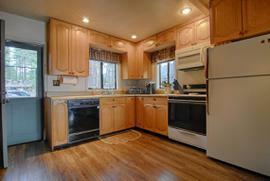 We have offices throughout the Tahoe and Truckee region. 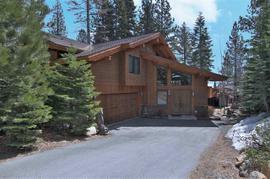 Our North Lake Tahoe real estate office is located at 475 North Lake Blvd in Tahoe City California. Please give me a call or text me at 1-530-448-1734 when you're ready to talk. Or email me at [email protected]. I've been a broker with Coldwell Banker Residential Services since 1999. Located just east of Dollar Point is the community of Cedar Flat. Homes within the Cedar Flat region are technically within the city of Carnelian Bay. 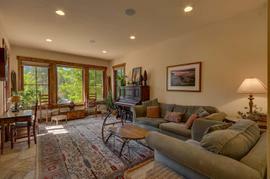 Homeowners love the central location with great access to both Squaw/Alpine and Northstar. The trails behind the homes are awesome. There's a great mix of gentle and challenging pitches and the trails connect up and over to Northstar and even out to Truckee. Although it's tough to tell from a casual drive through the neighborhood, the Cedar Flat region includes properties in many small subdivisions. Some real estate listings will reference the home as having a dedicated buoy and/or access to a private beach. Compared to homes on the West Shore that are beneath the crest of the Sierra Nevada mountains, this region will often see less snow and longer daylight hours. East of Cedar Flat is the community of Agate Bay. 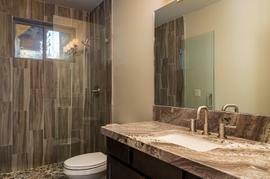 Homes in Agate Bay are also technically within the city of Carnelian Bay. Many of the homes in the subdivision offer homeowners access to a private pier with buoys. The HOA also offers access to a community pool that includes a grass play area and a sand volleyball court. Not all properties belong to the Agate Bay homeowners association and many can join if they're not a member. Patton Beach and Waterman's Landing offer public access to the beach and allow dogs on the beach. The Sierra Boat Company offers slips and storage for boats. Garwood's Grill and Pier is a lakefront restaurant and hosts events like the Polar Bear Swim, fireworks, and an Easter egg hunt for both adults and kids. The adults need to brave the cold water for the big prizes. East of Carnelian and Agate Bay begins the city of Tahoe Vista. 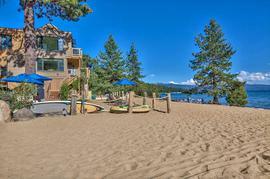 Homes in Tahoe Vista offer great access to the public sandy beaches. 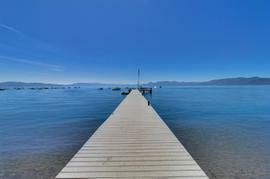 These North Lake Tahoe beaches have shallow water and awesome views of the mountains on the West and South Shore of Lake Tahoe. There's a public boat ramp located at the end of National Street. At the other end of National Street is the Tahoe Vista Regional Park. The park is huge and offers play structures, ball fields of both grass and turf, the Treetop Adventure Ropes Course, tennis courts, a dog park, frisbee golf course, and many miles of trails (both paved and dirt) for hiking and biking. During the winter they offer a great sledding hill and snowmobile rentals. The Tahoe Vista Park is a gem for sure. The city of Kings Beach has one of the largest sand beaches in North Lake Tahoe. The beach is public and the surrounding shops and choices for food make spending a day at Kings Beach very convenient. The community offers an old school mini-golf course that's a favorite for my boys. The Old Brockway Golf Course is a nine hole course that winds it way through the forest. They have a great restaurant on site with outdoor seating. Next to the golf course is Safeway and another public beach. If gambling is of interest, homeowners in Kings Beach are minutes from the casinos on the Nevada state line. Kingswood Estates is a subdivision on the hill above central Kings Beach. Homeowners love the easy access to Hwy 267 that connects Kings Beach to Northstar and Truckee. Trails from Kingswood Estates connect to Martis Peak, the Fire Lookout above the Nevada state line, and west to Tahoe City.